Download the nomination form here to nominate yourself or another farmer dedicated to supporting pollinator habitats! Does your farm have features to support habitats for birds, bees, butterflies, and other pollinators? Many Canadian farmers are working to improve the health of pollinators — a critical element of agriculture and local ecosystem. That’s why CFA has joined with the Pollinator Partnership (P2) and the Canadian Forage and Grassland Association (CFGA) to recognize farmers’ efforts to protect this indispensable natural resource. We are sharing their success stories through the annual Canadian Farmer-Rancher Pollinator Conservation Award. The award recognizes an individual or family in the farm and ranch community in Canada who has contributed significantly to pollinator species protection and conservation on either working or wild lands. Through this program, CFA, P2 and CFGA are encouraging stewardship and spreading knowledge that can inspire even more producers to initiate similar projects. Marc Bercier, winner of the 2016 award, stands near the pollinator habitat he constructed on his farm in eastern Ontario. Click here to see the 2016 Pollinator Award winner’s project to help pollinators on Farm to Table. The CFA congratulates Antony John of Soiled Reputation in Sebringville, Ontario on being the 2017 recipient of the Canadian Farmer-Rancher Pollinator Conservation Award. These aspects help create a sustainable ecosystem, helping soil health, pollinator populations and reducing soil erosion naturally. The CFA congratulates Marc and Chantal Bercier of Bercier Farms in St-Isidore-de-Prescott, Ontario on being the 2016 recipient of the Canadian Farmer-Rancher Pollinator Conservation Award. The Bercier’s have worked hard to improve the land around their farm, creating a wetland to help filter out water from their farm before it feeds into the nearby Scotch river. The wetland and farm are populated with pollinator sites with a wide range of over 30 species of flowers and plants to encourage biodiversity. Their efforts have helped to improve both soil and water quality on their farm and the surrounding area. The CFA congratulates David Ainslie of Golden Rod Farms in Essex County, Ontario on being the 2015 recipient of the Canadian Farmer-Rancher Pollinator Conservation Award. An innovative farmer who was among the first in his region to adopt conservation farming techniques, such as no-till cropping, David Ainslie has worked tirelessly to incorporate his understanding of natural systems into his farm operation. 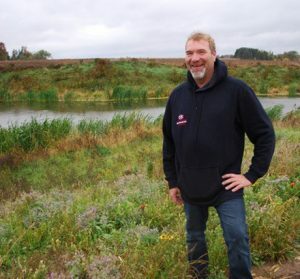 By designating some 40 acres of his land as natural areas – featuring a woodlot, wetlands, windbreaks and pollinator garden, just to name a few – David has succeeded in improving water quality and wildlife habitat on his farm, while proving that conservation efforts and conventional farming can work well together. The CFA congratulates Michael, Laura and Takota Coen of Grass Roots Family Farm as the 2014 recipients of the Canadian Farmer-Rancher Pollinator Conservation Award. While the Coens have been practicing sustainable farming since the late 1980’s, son Takota recently started investing in agroforestry on the family’s 250-acre farm. Takota has diversified several acres of farmland where livestock graze between rows of planted fruit, nut and timber trees. This approach provides immense benefits for local wildlife, most notably pollinators that gain increased habitat and food supply. Learn more about the Coens’ innovative efforts here. The CFA congratulates 2013 winners, Bryan and Cathy Gilvesy of YU Ranch in Ontario, for their leadership and innovation in cultivating natural ecosystems that both protect the pollinators and produce a strong food supply. The Gilvesy’s have been raising Texas Longhorns for more than 15 years. Commitment to a sustainable land ethic has always been an important part of their business. In an effort to improve the local ecology, they installed a 2000 ft pollinator hedgerow and bee nesting habitat. Read more about the Gilvesy’s work with pollinators, here. The CFA congratulates 2012 winners, Don and Marie Ruzicka of Sunrise Farm in Alberta, for their motivation to farm in harmony with nature and protect pollinators on their farm. The Ruzicka’s recognized that by creating conditions where pollinators could thrive, that they may also be able to enhance alfalfa and cicer milkvetch seed production on their pastures. Pollinator conservation has become such a high priority on their farm that a research project was initiated in 2010 to improve the understanding of how best to design shelterbelts for pollinators. Learn more about the Ruzicka’s work with pollinators, here. Pollinators are essential to the food system. Without them, we would lose one-third of our diet and most terrestrial ecosystems would collapse. In Canada, there are more than 1,000 pollinating species – including bees, butterflies, moths and beetles – that are essential to the production of over $1 billion in apples, pears, cucumbers, melons, berries and many other kinds of Canadian produce. These insects, and the crucial daily work they do, are being threatened by various factors. Clearly, agriculture has a role to play in the survival of our pollinators. CFA is committed to a science-based approach in dealing with bee health and neonicotinoid-treated seeds. While there remain conflicting preliminary scientific results on whether neonicotinoid-treated seeds are resulting in colony collapse disorder and poor honeybee health, the results of new seed planting measures from Health Canada are important in considering any new actions to protect and preserve the health of bees. Further studies are needed in order to gain a more comprehensive and definitive understanding of colony collapse disorder, the effect neonicotinoids may have upon the European honeybee and alternatives to neonicotinoid-treated seeds. Until there is a better understanding of the impact that specific neonicotinoids have on the health of pollinators, neonicotinoid-treated seeds represent significant environmental and health advancements in pest protection for several crops, as well as cost savings and increased productivity in the Canadian agricultural sector. To remove them as one of the tools available to farmers could result in the use of older, more hazardous pesticides that neonicotinoids had largely supplanted. CFA is dedicated to promoting a better understanding and appreciation of all pollinators, with a particular focus on bees, while continuously seeking to decrease any environmental impact of farming, promoting best practices and supporting pollinator habitat. Farmers have a very close relationship with pollinators and are committed to continue to provide quality pollinator habitat, supporting biodiversity and working closely with regulators to ensure effective and affordable pest management tools are available.